Since its establishment, the Human Rights Centre has constantly promoted conferences and study seminars organised in partnership with the Region of Veneto, local, national and international authorities and institutions, municipalities, provinces, civil society associations, and schools aimed at exploring the wide and articulated theme of human rights. The following pages collect information about the many conferences and seminars organised by the Centre in more than 25 years of activities. 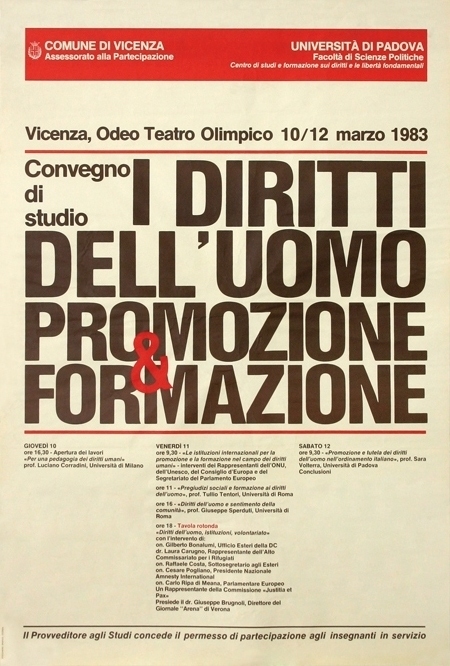 For the historical archives (from 1982 to 2009) the English version of the website provides the translations of conferences' and seminars' titles (and possible information) together with a direct link to the equivalent section in the Italian version. For recent conferences the English version provides a page for each event in English; links to Italian pages may be included in those pages. International Conference "Universality v. Particularity: Human Rights and Religions"
Photo Exhibition "VolunTour: Better Environment – Better Tomorrow"